Where to Buy Lebanon TRIMEC 1.81% Broadleaf Herbicide, Lebanon Broadleaf Weed Killer Trimec Herbicide - 20 Lbs - $31.95 for Sale with Fast Free Shipping! 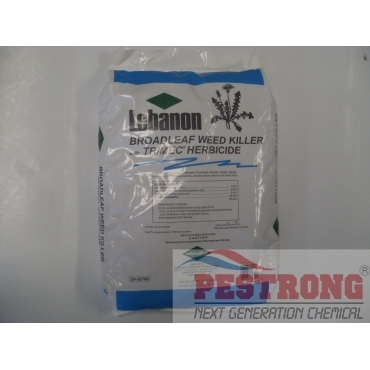 Lebanon Broadleaf Weed Killer Trimec Herbicide - 20 Lbs covers 10,000 sq.ft. that controls a wide range of lawn weeds including dandelion, chickweed, knotweed, plantain, henbit, spurge and many others. The maximum broadcast application rate is 2.0 pounds of product per 1,000 sq. ft. per application. The maximum number of broadcast applications is limited to 2 per year with a minimum of 30 days between applications. The maximum seasonal rate is 4.0 pounds of product per 1,000 sq. ft. Apply anytime weeds are growing - spring, summer or fall. 1. Mow lawn to normal height 1 to 2 days before application. 2. Water lawn thoroughly at least 1 day before application to sustain moisture until the next waterin. 3. Apply when weeds are young and actively growing, preferably in the morning when dew is on the grass. If grass is not moist at time of application, sprinkle lightly with water to allow the granules to adhere and to remain on the leaf surface of the weeds. 4. Do not wash from weed leaves for 1 to 2 days after application. At this time a thorough watering should be made.